Refer to LAN-7, "CAN COMMUNICATION SYSTEM : System Description". U1000 can be set if a module harness was disconnected and reconnected, perhaps during a repair. Confirm that there are actual CAN diagnostic symptoms and a present DTC by performing the Self Diagnostic Result procedure. CAN COMM CIRCUIT [U1000] When any listed module cannot communicate with CAN communication signal continuously for 2 seconds or more with ignition switch ON In CAN communication system, any item (or items) of the following listed below is malfunctioning. Turn ignition switch ON and wait for 2 second or more. Is вЂњCAN COMM CIRCUITвЂќ displayed? YES >> Perform CAN Diagnosis as described in DIAGNOSIS section of CONSULT operation manual. When DTC вЂњU1010вЂќ is detected, replace BCM. >> Replace BCM. Refer to BCS-126, "Removal and Installation". Regarding Wiring Diagram information, refer to BCS-111, "Wiring Diagram". Check that the following fuses and fusible link are not blown. Is the fuse blown? YES >> Replace the blown fuse or fusible link after repairing the affected circuit. Check voltage between BCM connector and ground. NO >> Repair harness or connector. Check continuity between bcm connector and ground. Check door switches DOOR SW-DR, DOOR SW-AS, DOOR SW-RL, DOOR SW-RR in Data Monitor mode with CONSULT. Is the inspection result normal? Yes >> door switch is ok.
No >> refer to dlk-253, "diagnosis procedure". Regarding wiring diagram information, refer to dlk-224, "wiring diagram". Check signal between BCM connector and ground with oscilloscope. Check continuity between BCM connector and door switch connector. Is the inspection result normal? YES >> GO TO 3 NO >> Repair or replace harness between BCM and door switch. Refer to DLK-255, "Component Inspection". Is the inspection result normal? YES >> GO TO 4 NO >> Replace malfunctioning door switch. No >> replace malfunctioning door switch. Transmits door lock/unlock operation to bcm. Check CDL LOCK SW, CDL UNLOCK SW in Data Monitor mode with CONSULT. Is the inspection result normal? Yes >> door lock and unlock switch is ok.
No >> refer to dlk-256, "driver side : diagnosis procedure". Regarding Wiring Diagram information, refer to DLK-233, "Wiring Diagram". Check voltage at the main power window and door lock/unlock switch connector when the switch (driver side) is turned to вЂњLOCKвЂќ or вЂњUNLOCKвЂќ. Disconnect main power window and door lock/unlock switch connector. Check continuity between main power window and door lock/unlock switch connector and ground. Check continuity between main power window and door lock/unlock switch terminals. Is the inspection result normal? Yes >> go to 4 no >> replace main power window and door lock/unlock switch. Refer to pwc-70, "removal and installation". Check continuity between bcm connector and main power window and door lock/unlock switch connector. No >> refer to dlk-258, "passenger side : diagnosis procedure". Check voltage at the power window and door lock/unlock switch rh connector when the switch (passenger side) is turned to вЂњlockвЂќ or вЂњunlockвЂќ. Disconnect power window and door lock/unlock switch RH connector. Check continuity between power window and door lock/unlock switch RH connector and ground. Check continuity between power window and door lock/unlock switch rh terminals. No >> replace power window and door lock/unlock switch rh. Check continuity between bcm connector and power window and door lock/unlock switch rh connector. When the mechanical key is inserted and turned into the front door lock key cylinder switch LH, the switch transmits the LOCK or UNLOCK signal directly to the BCM. 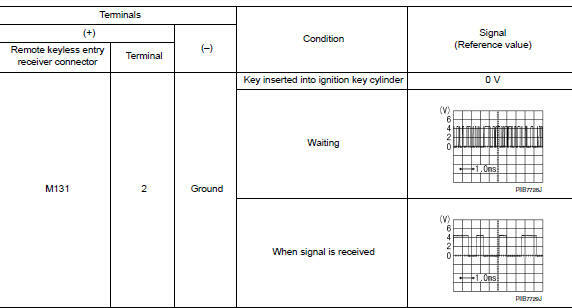 Check KEY CYL UN-SW, KEY CYL UN-SW in вЂњDATA MONITORвЂќ mode for вЂњPOWER DOOR LOCK SYSTEMвЂќ with CONSULT. Refer to DLK-221, "DOOR LOCK : CONSULT Function (BCM - DOOR LOCK)". Is the inspection result normal? YES >> Key cylinder switch is OK.
NO >> Refer to DLK-260, "Diagnosis Procedure". Is the inspection result normal? Yes >> front door lock key cylinder switch lh is ok. Disconnect front door lock key cylinder switch lh connector. Check continuity between front door lock key cylinder switch lh connector and ground. Check continuity between front door lock key cylinder switch LH connector and BCM connector M21. Check door key cylinder switch. Refer to dlk-261, "component inspection". No >> replace front door lock key cylinder switch lh. Check front door lock key cylinder switch lh. Check key switch "key on sw" in data monitor mode with consult. Refer to dlk-221, "door lock : consult function (bcm - door lock)". 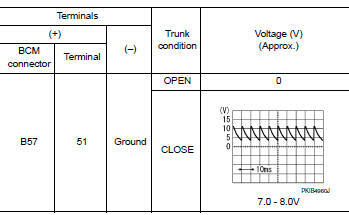 Check voltage between bcm connector m21 terminal 37 and ground. Is the inspection result normal? Yes >> key switch (insert) circuit is ok. 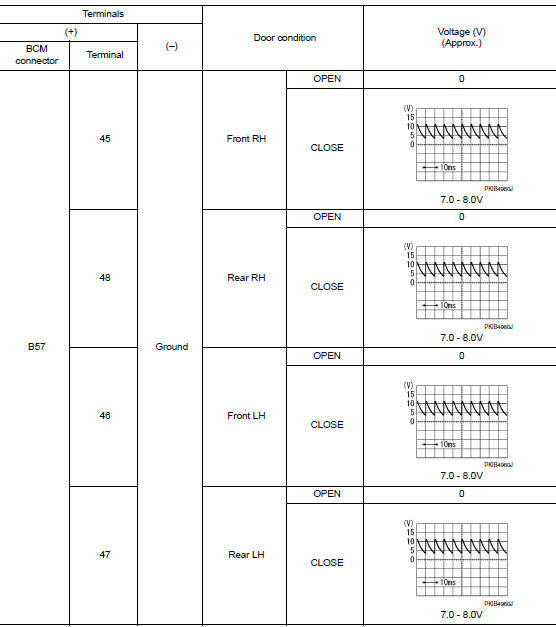 Check continuity between key switch terminals. Is the inspection result normal? YES >> Repair or replace harness or fuse. NO >> Replace key switch. Locks/unlocks the door with the signal from bcm. Use consult to perform active test (вЂњdoor lockвЂќ). Touch вЂњall lockвЂќ or вЂњall unlockвЂќ to check that it works normally. Is the inspection result normal? Yes >> door lock actuator is ok.
No >> refer to dlk-263, "driver side : diagnosis procedure". Disconnect bcm and front door lock actuator driver side connector. Check continuity between bcm connector and front door lock actuator driver side connector. Is the inspection result normal? Yes >> replace front door lock actuator lh. No >> refer to dlk-264, "passenger side : diagnosis procedure". Disconnect bcm and front door lock actuator rh connectors. Check continuity between bcm connector and front door lock actuator rh. Is the inspection result normal? Yes >> replace front door lock actuator rh. No >> refer to dlk-265, "rear lh : diagnosis procedure". Disconnect bcm and rear door lock actuator lh connectors. Check continuity between bcm connector and rear door lock actuator lh connectors. Is the inspection result normal? Yes >> replace rear door lock actuator lh. No >> refer to dlk-266, "rear rh : diagnosis procedure". Disconnect bcm and rear door lock actuator rh connectors. Check continuity between bcm connector and rear door lock actuator rh connectors. Is the inspection result normal? Yes >> replace rear door lock actuator rh. Receives keyfob operation and transmits to bcm. Check remote keyless entry receiver keyless lock, keyless unlock, and keyless panic in data monitor mode with consult. Is the inspection result normal? Yes >> remote keyless entry receiver is ok.
No >> refer to dlk-268, "diagnosis procedure". Check signal between remote keyless entry receiver connector and ground with oscilloscope. Disconnect remote keyless entry receiver connector. Check continuity between BCM connector and remote keyless entry receiver connector. No >> repair or replace harness between bcm and remote keyless entry receiver. Check continuity between remote keyless entry receiver connector and ground. No >> repair or replace harness between bcm and remote keyless entry. The following functions are available when having and carrying the keyfob. Remote control entry function and panic alarm function are available when operating the remote buttons. The Signal Tech II Tool (J-50190) can be used to perform the following functions. Refer to the Signal Tech II User Guide for additional information. Keyless lock Checks whether value changes from "Off" to "On" when operating keyfob lock button. KEYLESS UNLOCK Checks whether value changes from "off" to "on" when operating keyfob unlock button. Keyless panic Checks whether value changes from "off" to "on" when operating keyfob panic button. Is the inspection result normal? Yes >> keyfob is ok.
No >> refer to dlk-271, "diagnosis procedure". Check keyfob function using signal tech ii tool j-50190 or remote keyless entry tester j-43241 (shown). Does the test pass? 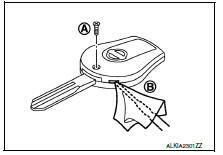 Yes >> keyfob is ok.
Insert a small screwdriver into the slit of the corner (b) and twist it to separate the upper part from the power part. Use a cloth to protect the casing. The keyfob is water-resistant. However, if it does get wet, immediately wipe it dry. Keep dirt, grease, and other foreign materials off the electrode contact area. Visually inspect keyfob internal components. Check by connecting a resistance (approximately 300ù) so that the current value becomes about 10 ma. Is the measurement value within specification? Yes >> keyfob battery is ok. Check remote keyless entry receiver. Refer to dlk-268, "component function check". 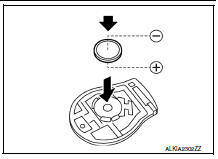 Replace the keyfob battery with a new one (CR1620 or equivalent). Make sure that the + side faces the bottom of the case. Align the tips of the upper and lower parts, and then push them together until it is securely closed. After replacing the battery, check that all keyfob functions work properly. No >> check remote keyless entry receiver. Refer to dlk-268, "component function check". Perform answer-back for each operation with horn. Select horn in вЂњactive testвЂќ mode with consult. Is the operation normal? Yes >> inspection end. No >> refer to dlk-273, "diagnosis procedure". Check horn function with horn switch. No >> refer to hrn-3, "wiring diagram". Using an oscilloscope or analog voltmeter to check voltage between ipdm e/r connector and ground. Is the inspection result normal? Yes >> repair or replace open harness between ipdm e/r and horn relay. Disconnect IPDM E/R and horn relay connector. Check continuity between ipdm e/r harness connector and horn relay harness connector. Check continuity between ipdm e/r harness connector and ground. Is the inspection result normal? Yes >> replace ipdm e/r. Refer to pcs-58, "removal and installation". No >> repair or replace the malfunctioning part. Select trunk/glass hatch in active test mode. Touch open to check that it works normally. Is the inspection result normal? Yes >> trunk lid opener actuator is ok.
No >> refer to dlk-275, "diagnosis procedure". Regarding wiring diagram information, refer to dlk-241, "wiring diagram". Disconnect trunk lid opener assembly connector. Check voltage between trunk lid opener assembly harness connector and ground. Check continuity between BCM harness connector and trunk lid opener assembly harness connector. Is the inspection result normal? Yes >> replace bcm. Refer to bcs-126, "removal and installation". Check continuity between trunk lid opener assembly harness connector and ground. Is the inspection normal? YES >> Replace trunk lid opener assembly. Select trunk of bcm using consult. Select tr/bd open sw in data monitor mode. Check that the function operates normally according to the following conditions. Is the inspection result normal? YES >> Trunk lid opener switch is OK.
NO >> Refer to DLK-277, "Diagnosis Procedure". Disconnect trunk lid opener switch connector. Check signal between trunk lid opener switch harness connector and ground using oscilloscope. Check continuity between BCM harness connector and trunk lid opener switch harness connector. Check continuity between trunk lid opener switch harness connector and ground. Refer to dlk-277, "component function check". No >> replace trunk lid opener switch. Check continuity between trunk lid opener switch terminals. Check trnk/hat mntr in data monitor mode with consult. Is the inspection result normal? Yes >> trunk room lamp switch is ok.
No >> refer to dlk-279, "diagnosis procedure". Disconnect bcm and trunk lid opener assembly connector. Check continuity between bcm connector and trunk lid opener assembly connector. No >> repair or replace harness between bcm and trunk lid opener assembly. Check continuity between trunk lid opener assembly connector and ground. No >> repair or replace trunk lid opener assembly ground circuit. Ensure trunk lid remains closed during this step. No >> replace bcm. Refer to bcs-126, "removal and installation". No >> replace trunk lid opener assembly. Check trunk room lamp switch. Performs operation method guide and warning with buzzer. Check the operation with вЂњBUZZERвЂќ in the Active Test. Touch вЂњign key warn almвЂќ, вЂњseat belt warn testвЂќor вЂњlight warn almвЂќon screen. Is the inspection result normal? Yes >> warning buzzer into combination meter is ok.
No >> refer to dlk-282, "diagnosis procedure". Operate the hazard lights by turning on the hazard warning switch. Perform answer-back for each operation with number of blinks. Check hazard warning lamp (вЂњflasherвЂќ) in active test. Is the inspection result normal? 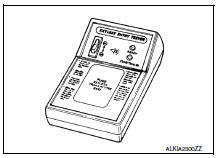 Yes >> hazard warning lamp circuit is ok.
No >> refer to dlk-283, "diagnosis procedure". NO >> Repair or replace hazard warning switch circuit. Refer to EXL-129, "Removal and Installation". If a keyfob is lost, the id code of the lost keyfob must be erased to prevent unauthorized use. A specific id code can be erased with consult. However, when the id code of a lost keyfob is not known, all controller id codes should be erased. After all id codes are erased, the id codes of all remaining and/or new keyfobs must be re-registered. When registering an additional keyfob, the existing id codes in memory may or may not be erased. If five id codes are stored in memory when an additional code is registered, only the oldest code is erased. If less than five codes are stored in memory when an additional code is registered, the new id code is added and no id codes are erased. Even if the same id code that is already in memory is input, the same id code can be entered. The code is counted as an additional code. Use this mode to register a keyfob id code. Register the id code when keyfob or bcm is replaced, or when additional keyfob is required. Use this mode to erase a keyfob id code. Use this mode to confirm if a keyfob id code is registered or not. To erase all id codes in memory, register one id code (keyfob) five times. After all id codes are erased, the id codes of all remaining and/or new keyfobs must be re-registered. When registering an additional keyfob, the existing id codes in memory may or may not be erased. If five id codes are stored in memory, when an additional code is registered, only the oldest code is erased. If less than five id codes are stored in memory, when an additional id code is registered, the new id code is added and no id codes are erased. If you need to activate more than two additional new keyfobs, repeat the procedure вЂњadditional id code entryвЂќ for each new keyfob dlk-284, "id code entry procedure" (with consult), dlk-285, "id code entry procedure" (without consult). A maximum amount of five id codes is allowed. When more than five id codes are entered, the oldest id code will be erased. Even if same id code that is already in the memory is input, the same id code can be entered. The code is counted as an additional code.